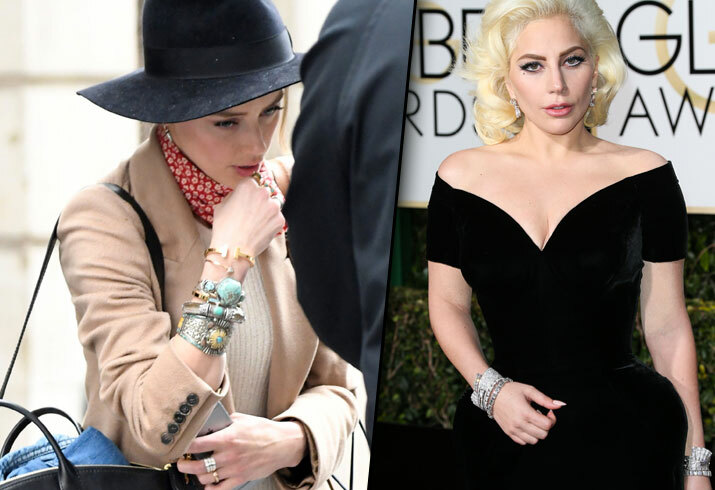 When Lady Gaga showed up at the Golden Globes earlier this year, her sparkling silver cuffs were a classy match to her black gown. Click through to get even more bracelet and cuffing inspiration that you can steal for big end-of-the-year parties! Johnny Depp's ex Amber Heard may have been all bundled up for a chilly day, but her bracelet game was on full display for the cameras. Television news anchor Kathie Lee Gifford paired a pretty blue dress with a patterned gold cuff that totally completed her look. Singer Rita Ora doesn't hold back from dressing up her wrists, either! Looking to complete your bracelet obsession with the perfect necklace? It can't get any better than a Le Vian's 18K Honey Gold necklace with 7.58 total carat weight of Blueberry Sapphires and 10.7 total carat weight of baguette and rectangular cut Vanilla diamonds!